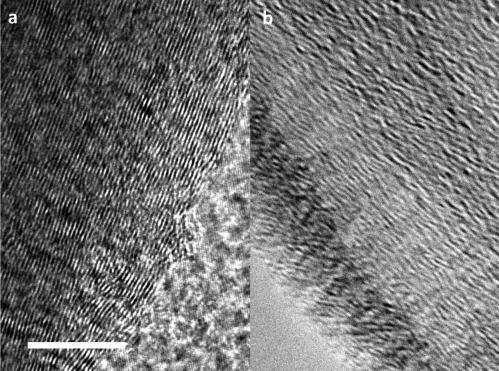 TEM images of (a) pristine graphite and (b) expanded graphite. The scale bar is in 10 nm. (Phys.org) —As the demand for rechargeable lithium-ion (Li-ion) batteries has grown, the battery industry has found itself facing a problem of supply-and-demand. Lithium is not an abundant element, and most lithium deposits are found in only a handful of countries. Both problems make its long-term availability and cost uncertain. In a paper published in the June 4 issue of Nature Communications, University of Maryland professors Chunsheng Wang and John Cumings explain how a modified version of a Li-ion battery anode could allow manufacturers to replace the lithium with a more common element. Sodium (Na), an earth-abundant and inexpensive element, shares many properties with lithium, but so far has not been able to replace it. The best strategies for creating Li-ion batteries often can't be adapted for use in Na-ion batteries, rendering them a laboratory curiosity and keeping them out of the market. The main problem is the atom's size. Sodium ions are larger than lithium ions, which limits the kinds of materials that can be used in a Na-ion battery anode, the component into which the positively charged ions flow. Graphite (a form of pure carbon) is among the most superior options, and is also the most common in Li-ion batteries. When creating graphite anodes, lithium ions are easily electrochemically intercalated (embedded) into its layered structure, but for sodium ions it's a tight squeeze, and the result is a battery with sluggish performance and low capacity. The solution, Wang and Cumings have discovered, is to increase the space between the individual layers of carbon that make up the graphite. Their team starts with graphite oxide, a common industrial material formed by exposing graphite to an aggressively corrosive solution that stuffs oxygen between its layers. The oxygen atoms bond with each carbon layer, pushing and holding them apart. However, the resulting material is inevitably "overstuffed," leaving no room for sodium ions to get in. To make the material suitable for use in Na-ion batteries, some of the oxygen must be removed. The solution to this second problem was developed by the paper's first author, Department of Chemical and Biomolecular Engineering (ChBE) graduate student Yang Wen. Wen heats the expanded, oxidized graphite to high temperatures and floods it with argon gas, causing it to decompose. In this process, oxygen bonded to carbon breaks away in the form of either carbon monoxide (CO) or carbon dioxide (CO2) gas, which is caught up and removed by the argon gas flow. Wen's key discovery is the precise combination of temperature and duration for the reaction. Her technique ensures that enough oxygen atoms have been removed to let the sodium ions in, but enough are left behind to prevent the expanded graphite from collapsing. The process may be likened to jacking up every floor of a multi-storey building to accommodate taller tenants, and then removing excess scaffolding until only the required support beams remain. After testing the material both in experimental batteries and in a transmission electron microscope for realtime observations, the team found that Na-ion battery anodes manufactured with the expanded graphite had good energy density and retained 73 percent capacity after 2000 charge/discharge cycles. "Expanded graphite is already commercially available," explains Wang, an associate professor of ChBE, "but industry uses a different method to make it. If they follow Yang's procedure, they can use it to make expanded graphite suitable for sodium-ion batteries." However, he adds, "they won't be as powerful as lithium-ion batteries. You'll need more of them to get the same amount of power, but the cost is so much lower it will make up for it." Cumings, an associate professor from the Department of Materials Science and Engineering, agrees. "Sodium-ion batteries are also heavier, so for now they're not suitable for most vehicles and airplanes. But for something like building or grid-level power storage–where they're just going to sit there–the fact that you get more kilowatt hours per dollar becomes a strong selling point." Lithium sulfur: A battery revolution on the cheap? As the demand for rechargeable lithium-ion (Li-ion) batteries has grown, the battery industry has found itself facing a problem of supply-and-demand. Lithium is not an abundant element, and most lithium deposits are found in only a handful of countries. But it's nice to see that sodium, not too surprisingly, is workable too. We recognized the oil crisis back in 1973 and for some reason decided that numerous and continuing war was the solution. Strong proof that violence is a resort of really weak minds. Lithium reserves are as abundant like the rare earth metals reserves and as we all know, not everything is pink in their market already. The problem is the economy of their mining, as usually.